June 17, 2013 By This post may contain affiliate links. These Red, White, and Blue Fudge Stars are a great way to flair up your next patriotic party! They’re simple to make and so yummy to eat! 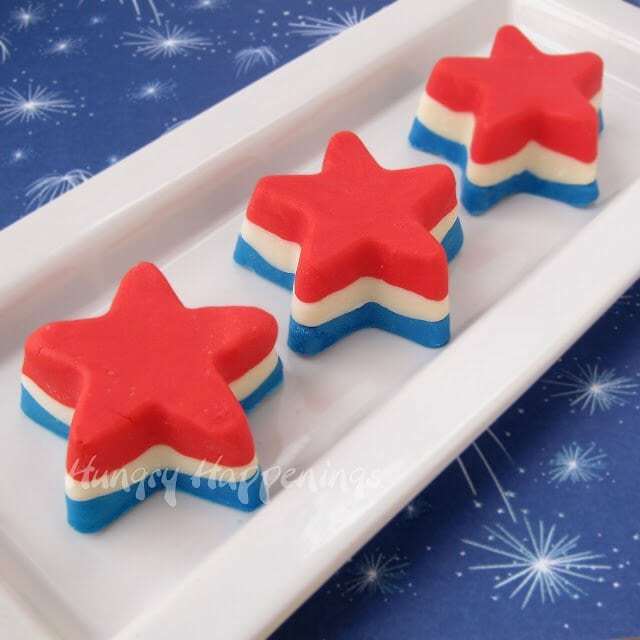 Two years ago I brought these Creamy Coconut Red, White, and Blue Stars, pictured above, to a Fourth of July party. I heard lots of oooohs and aaaaaahs, and a few too many ewws. Don’t get me wrong, these coconut candies are wonderful, but there are a lot of coconut haters out there, and many were at the party that day. I love coconut, as do a handful of my friends, and those lucky few were more than happy to wrap up the extras to take home with them. 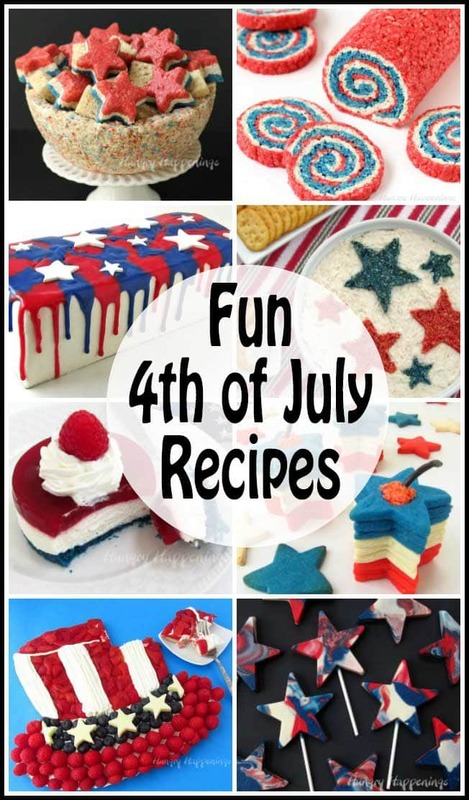 I understand that not everything I make will please the masses, but I liked this red, white and blue star so much, that I felt compelled to use a recipe that would appeal to a larger crowd. I chose to use white chocolate fudge. It’s easy to color and mold as long as you follow my step-by-step instructions. When I made my Conversation Heart Fudge earlier this year, I tried to just pour the warm fudge into the mold, but the finished candies were wrinkled and ugly, so I came up with a simple solution.My method for making these stars out of fudge is so easy that even kids can help. They’ll have fun smashing the fudge into the molds. Their little hands will make easy work of it. 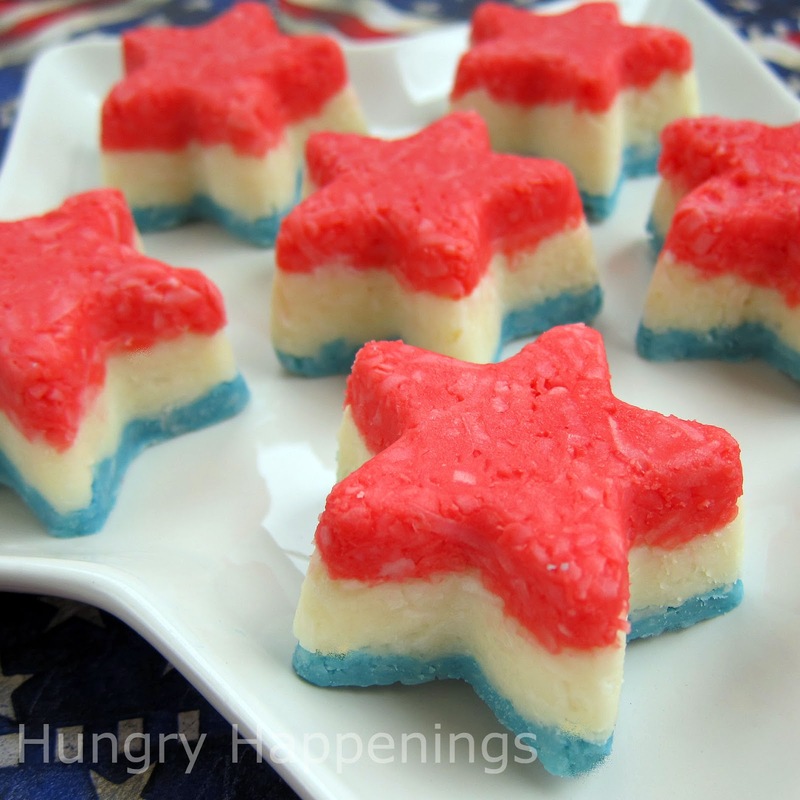 I know many of you attend outdoor picnics on July 4th, and although these are made using white chocolate, you can serve them outside as long as you place them in a shady spot on the table. Heat white chocolate or white confectionery coating and sweetened condensed milk in a medium saucepan over low heat. Stir frequently until about half of the chocolate or candy coating is melted. Turn off heat or remove from stove top and let sit for two minutes then stir until smooth. The heat from the melted chocolate will help to melt the remaining pieces of chocolate. If you still have un-melted pieces, set the pan back over low heat for a minute, then repeat. NOTE: If you overheat this creamy white fudge, it will become greasy as the cocoa butter may seep out of the chocolate. If that happens see how you can fix it, here. Equally divide the white chocolate fudge into 3 bowls. Color one bowl red, one bowl blue, and leave one bowl white. Allow the fudge to sit at room temperature for 30-60 minutes to cool and thicken. Divide the red fudge into 12 equal pieces. Roll into balls and press into the bottom of your silicone star molds. Divide the white fudge into 12 equal pieces and press them on top of the red fudge in the molds. Repeat with the blue fudge. Allow fudge to sit at room temperature for 2 hours. Pop fudge stars into the freezer for 15 minutes. Then remove and un-mold. 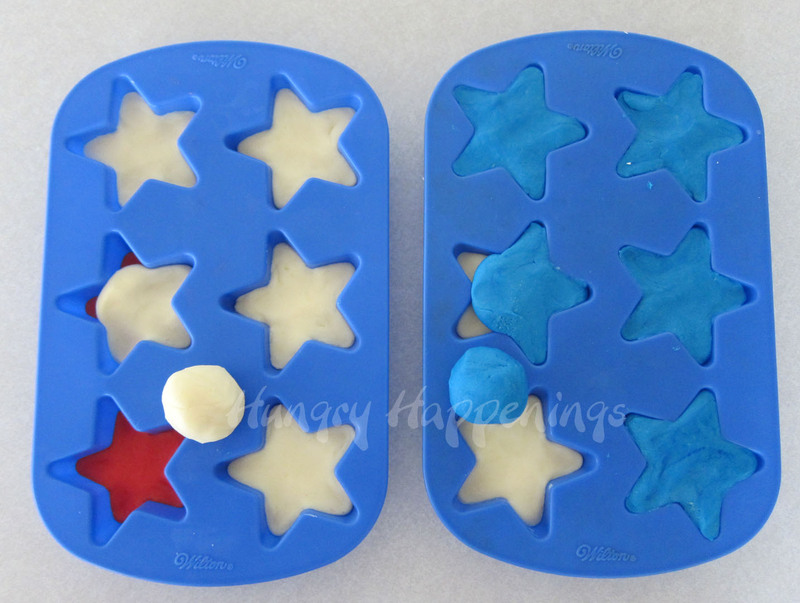 Press on the back side of each star mold, pushing the fudge out onto your work surface. They are ready to serve. 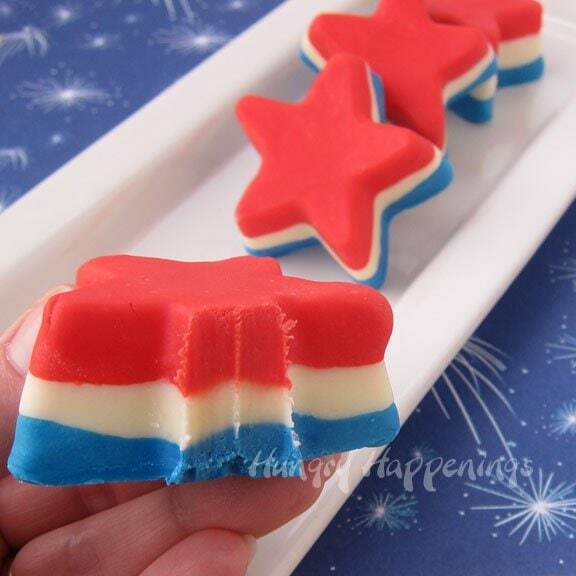 Store your Red, White and Blue Fudge Stars in an airtight container at room temperature for up to 2 weeks. I need to get some of those molds you use. These are so festive! I highly recommend getting some of the silicone molds for candy making and baking. They are really easy to use. Wow these look so beautiful!!! I actually have those same star molds too!!!! I'll have to try something similar out, thanks so much for the idea!! I really do love the silicone molds for candy making. I hope you find some great uses for them too! 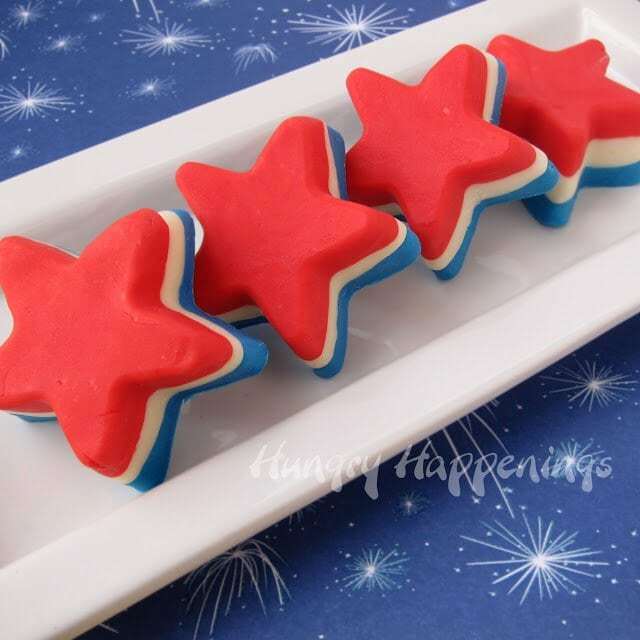 These fudge stars deserve a party of their own! LOVE LOVE! Too bad they have already been gobbled up! My parents took them to a friend's cabin this weekend. They loved 'em. I agree with Kim! You need to have a party for this fudge! Looks yummy!! This is one more great tip I find here. Love this blog. Beautiful!!! Pinned, thanks for coming to Sat. Dishes! You always have such great treats! Thanks for sharing on Two Cup Tuesday. Pinned it! Thank you and I appreciate the pin! Hi, these look so good and I would love to make them. I saw it on made by you monday. You are so talented. Every time I am on here I am amazed at the things you create! Thanks for featuring these today on Best Mom Advice! I love these 4th of july stars!!! These are so pretty! Also, I LOVE coconut, so feel free to make me some of those creamy coconut stars. 🙂 I'll be sharing a link to this in a roundup this week on my blog! I am a coconut lover – so how are the coconut stars made? Same recipe except you just add coconut? I've got to try these for sure – I may end up eating them all!! 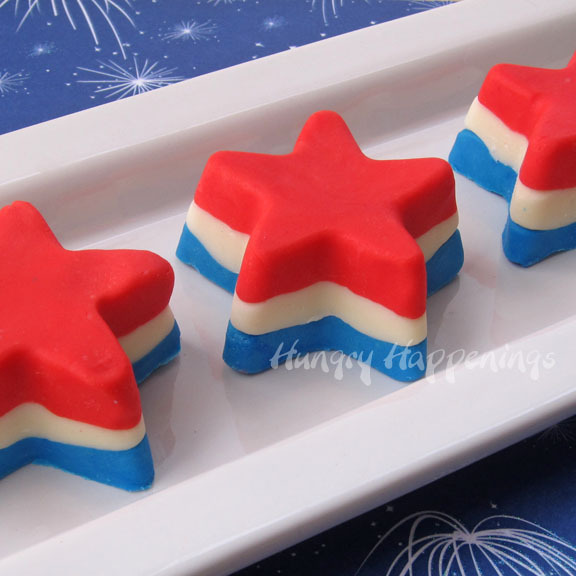 The recipe for the coconut stars is here, https://hungryhappenings.com/2011/06/red-white-and-blue-striped-creamy_20.html, but Wilton has Limited Edition Coconut Candy Melts on the market right now, and they could be used in this fudge recipe in place of the white chocolate. That would be great. I am going to order some of the products you use from Amazon. It says you earn a commission, is there something I need to do so you get the commission? Thanks for asking, Carol. Just click on the link provided in the post for each product and I will automatically receive the commission with no extra cost to you!